Ireland has always been a land of contrasts. This is true of both its stunning, natural beauty and its political history. From the very first written account – nearly 2,000 years ago – through its ancient poetry (some of which is thought to go back even further), we read that Ireland has been a land of petty kings and almost continual fighting and raiding. So much so that by the end of the tenth century there were up to 150 kings within Ireland – a relatively modest area roughly the size of the state of South Carolina – that’s just over an average of 213 square miles per kingdom. In the ninth century the Vikings arrived and began to colonise the land building the first towns. These soon became cities like Dublin, Cork and Wexford. Finally, in 1169, an Anglo-Norman-Welsh-Fleming force landed and began the wholesale conquest of Ireland as an adjunct of the English Crown. Yet this conquest proved abortive and by the fourteenth century the area of English control – known as the Pale – was just the area around the city of Dublin. In the outlying regions, various Anglo-Irish kings, princes and lords vied for supremacy in their small pieces of the world. To achieve this end they built a myriad of castles. These enigmatic structures – now in various stages of ruin – speckle the stunning Irish landscape. 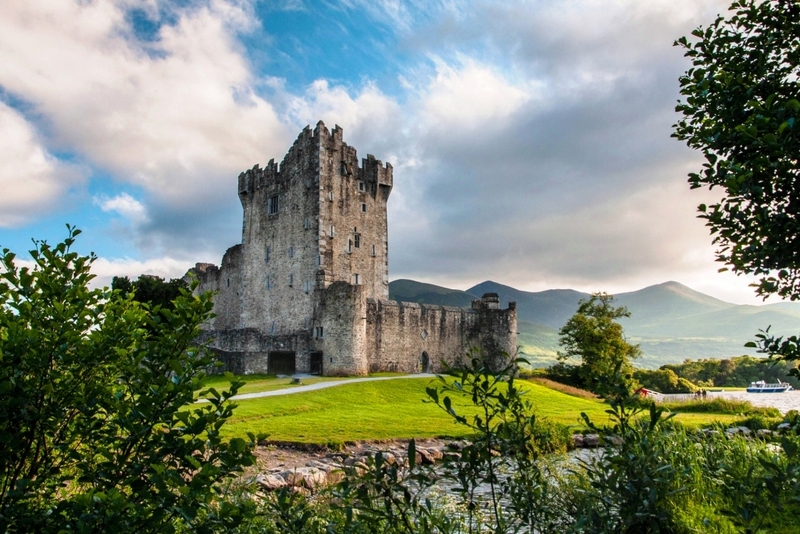 Each of them reveals a fascinating slice of Ireland’s history. 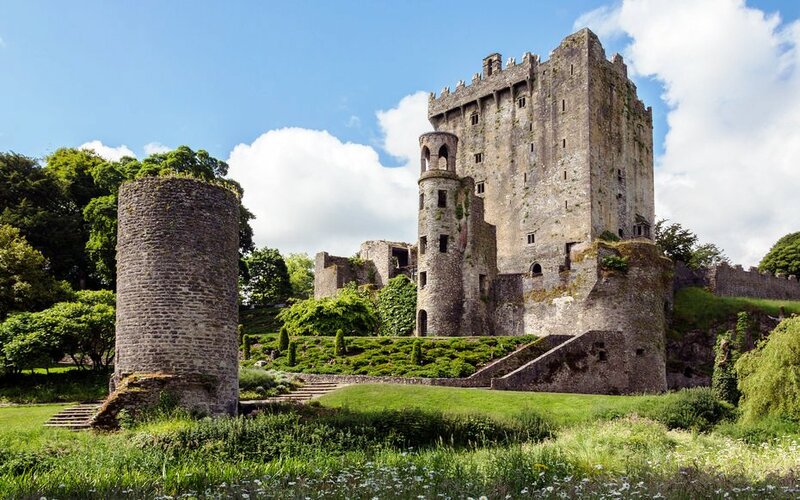 By visiting these, set amongst the wondrous natural beauties of Ireland, the traveler can begin to piece together the fascinating story that makes up the history of this island. And what a story the castles of Ireland tell! The era of castles starts before the coming of the English. Our sojourners will visit the great centre of Limerick where the Vikings had a castle which can still be seen under the ruins of King John’s fortress. This can be compared with the great hill-top fortress of Dunamase, its great walls still dominating the central plains of Ireland. Further south lies the stunning Rock of Cashel whose summit is covered in the remains of church and castle, parts of which are built in a remarkable twelfth century German style. From the Norman era we will begin with the great 20 sided keep of Trim built by the earliest Anglo-Norman settlers in Meath during the 1170s. This can be compared with the far more modest Glanworth, set deep in the wilds of Munster. 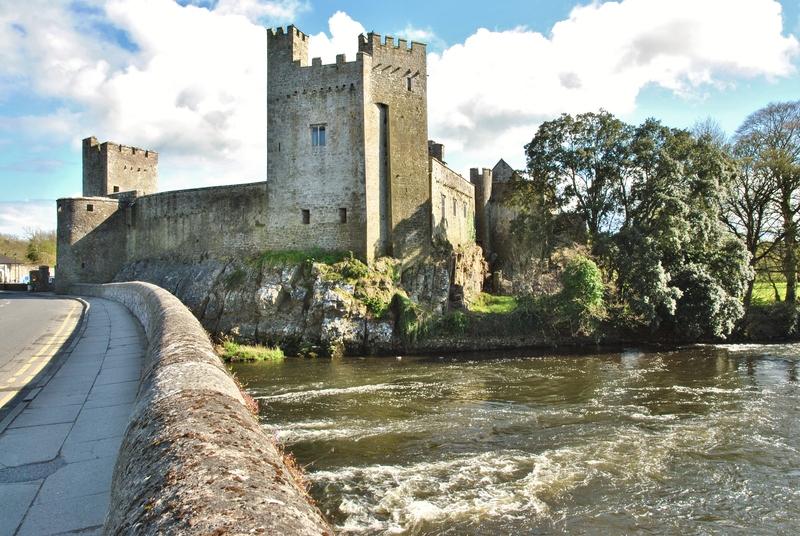 Nearby is Cahir, once the most powerful castles in Ireland, surrounded on all sides by a river and still inhabited until 1961. Back in the north is the great round keep of Dundrum, as well as the great thirteenth century Anglo-Norman fortresses like Carrickfergus, which was last defended in anger during the Napoleonic wars. Not to be missed is the idiosyncratic castle of Carlingford, a favourite fortress of King John who played such a part in Ireland’s development. Finally, from the later times when the Anglo-Norman lords became more Irish than the Irish themselves there will be visits to the great rocky promontory castle of Dunluce – which stands next to the world famous Giant’s Causeway – as well as visiting the beautiful river castle of Adare, the 100 foot high and still climbable keep of Nenagh, the archbishop of Dublin’s beautiful fortress at Swords and, of course, what visit to Ireland would be complete without hanging upside down from a 100 foot high tower and kissing the Blarney stone?